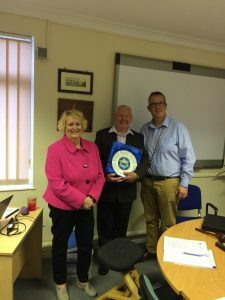 Following receipt of the news that Roy and Shirley Hayles would be leaving Hayle to move to Canada to be nearer to family members, the town council decided to honour them by presenting them with a town plate as a mark of recognition of all their many years of service to the town. At the full council meeting on Thursday 5 April 2018 the mayor welcomed Mr and Mrs Hayes and presented them with the town plate, thanking them for their longstanding service to the town with the Royal British Legion, particularly the Poppy Appeal and the Remembrance Day and Civic Parades. He wished them good luck for their new life abroad. Mr Hayes thanked the mayor and the town council for the honour and gave a brief history of their service to the town through their respective involvement with the Air Training Corps, Royal British Legion and his time acting as Parade Marshal.